The plugin has no configuration options on Plugin settings page. 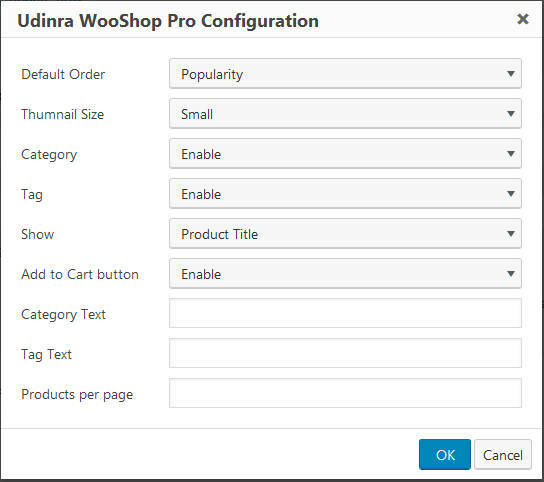 Below image shows all the configuration options available after you click on Visual Editor button.You can customize the Shop with configuration options. Most of the options are self explanatory but I have given details for each of them for your reference. The order in which your products will be sorted initially. The visitor can re sort the items from drop down provided on shop page. The size of product image. Currently two values are supported Medium and Small. If you enable category then there will be a drop down available on Shop page. Visitors can filter the products displayed using Category drop down. Products matching that category will only be displayed on Shop page. Note initially when shop page is loaded all products are displayed. Customer have the option to filter the products based on category if above option is enabled. It behaves similar to Category. But if you do not have any Tag then this field is populated with Sub category. Visitors can filter products based on sub category as well along with category. This option governs what you want to display below product image. You can display Product Title , Rating and Review count or any combination of them. If this option is enabled Add to Cart button is displayed on Shop page below the Product Image and options you selected in Show option. You can change the Text displayed on Category drop down. For example if you have Music store then you can change it to something meaningful and matching to your content like Artists. So visitors can filter the Music with different Artists. This one is similar to Category Text but is applicable for Tag drop down (or sub category drop down). This option helps you decide number of products you want to display on first page of Shop. This number should not be too large as it will impact page load time. This number should not be too small as well. You can set this number along with Product Image size as per your store need.